Is it snowing in Bridger Bowl ?Thank you! Bridger Bowl in the United States (Montana State) is a medium sized ski resort with 7 ski lifts (7 chair lifts) that offers skiers an incredible 2000 metres (6562 feet) of vertical descent. Bridger Bowl has 1500 acres of terrain over 69 trails. 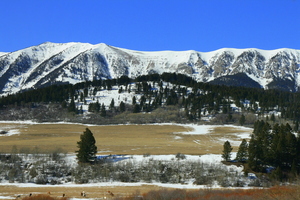 Bridger Bowl is best suited to advanced and intermediate skiers and snowboarders. We have no information about the existence of any cross country ski trails at Bridger Bowl. For snowboarders, there is a terrain park. A small proportion of the trails at Bridger Bowl are covered by snowmaking. The nearest airport is at Helena. Bozeman local here (moved from Vermont 6 months ago). I must say I don't see the hype about Bridger. Slow lifts (that don't even go to the top of the mountain so you have to hike to the top), gets tracked out really fast and way too many people (I only ski on weekends). Plus, you have to have a transceiver to go over to Slashman's (which is where all the gnarliest lines are) and they don't even have signs telling you that. I definitely prefer Big Sky.